The History of the Development of the "TDD" device for the deaf and hearing impaired. Deafness has been traditionally known as the "silent handicap". Few people are even aware when hearing-impaired persons, who make up 8-10% of the world's population, are living or working near them. The invention of the telephone was a significant contribution to the development of society as we know it today. The Deaf and Hearing Impaired were unable to benefit from this 19th Century breakthrough until fairly recently. The worldwide impact this change made for the deaf has been astounding. Since then, deaf persons could communicate without having to be face to face, could hold jobs they never were able to before, could develop a better social life, could contact emergency services, and, in general, were able to benefit from all the other uses of telephone communication that most of us took for granted. 1970 was a turning point for me. I was 24 years old. My friend K. Patrick (Kit) Corson and I were discussing the state of the world over a pizza at his apartment one afternoon in Oakland, California. I was lamenting to Kit how fed up I was to work and be creative for the sole purpose of making money so you could live in a nice home, drive a nice car, and eat pizza. It all seemed so empty. I told Kit I needed to find something to do that would help people, something that would make a difference. He calmly replied, "Did you know that deaf people can't use the telephone?" My life was changed forever at that moment. I had that feeling that makes you tingle all over; I knew that was my answer! Kit was the hearing son of deaf parents. He recounted to me his childhood as an interpreter between his parents and the rest of the world. The only time his parents could communicate over a telephone was through him, or some other hearing person. They could not communicate directly with their other deaf friends unless they were face to face, using sign language. Kit had recently decided to devote his time to helping the deaf through his skills as an interpreter. He was just developing a news program in San Francisco, called Newsign 4. It was a short segment aired during the regular Channel 4 news program so that the deaf could receive TV news. It featured two deaf people, Peter Wexberg and Jane Wilk using sign language, with Kit and his wife, Stephanie as voices. There were a few deaf people at that time who could communicate over distances. A deaf physicist , Dr. Robert (Bob) Weictbrect, had been using obsolete Teletype machines to communicate with his friends since 1964. Bob and his friends, Jim Marsters and Andrew Saks, eventually formed Applied Communications, Inc. in Belmont, California. 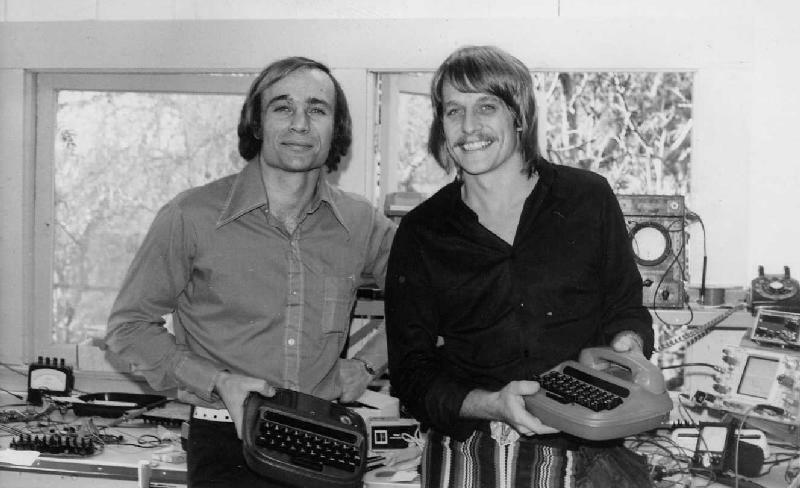 They designed and marketed an analog modem (MOdulator-DEModulator) that converted the signals from the old Baudot-coded Teletypes into tones that could be transmitted over the telephone. 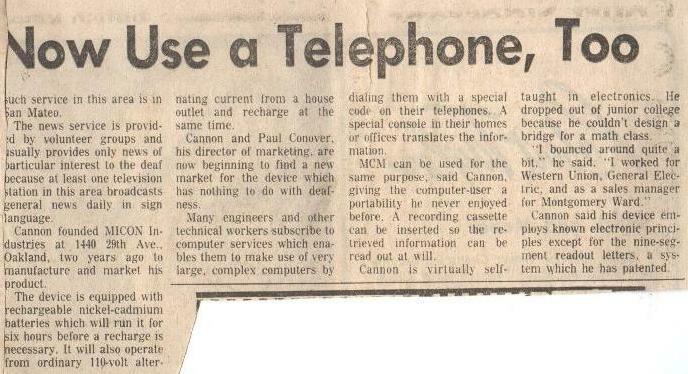 It was a great idea, except that Teletype machines weighed 200 pounds, and were very expensive. The few Teletype machines they could obtain were mostly donated by their owners. At the time, I was not aware of Bob and his efforts. I spent a great deal of time just trying to envision how to solve the problem of deaf telecommunications. I decided the device had to be small and portable so that a deaf person could use it anywhere he or she could find a telephone. Then I saw it. Montgomery Wards had just started selling a four-function calculator, about the size of a pack of cigarettes. It ran (for a short time) on batteries, and had a bright red display made with a new technology known as Light Emitting Diodes, or LEDs. I forked over $100 and bought one! The wheels started turning- if they could show numbers that way, I could find a way to show letters! If they could enter numbers, I could find a way to enter letters! Add a modem and I had my answer! Unfortunately, no one made LEDs that would make letters. There were some electronic displays manufactured at the time that would show letters, but they used high-voltage gas-discharge technology, somewhat like neon lights, that were big, very expensive and not able to be run off of batteries. LEDs had 7 segments that would individually light up to form the numerals 0-9. The gas-discharge displays that could make letters had 14 or 16 segments so the more complex diagonal shapes of letters could be created. So I did some investigating. I even contemplated building my own epitaxial reactor so I could create my own LEDs. That approach had too many things that could go wrong. One day, I was looking at another new product- a watch made with LEDs. I noticed that this one had 9 segments. The extra two segments were used to center the numeral "1" instead of having it off to the side as 7 segment Leds did. The wheels started turning again. I sat down with a pencil and paper and drew the first alphabet that used only 9 segments to make all the letters. Heh! I contacted an LED maker, Lightronix Corporation, in Silicon Valley. They explained to me that their 9 segment watch displays were only made in a watch format, with four numerals and a colon in between to show time, i.e 12:34. I inquired how much it would cost to make a custom arrangement. A few days later one of their excutives was knocking at the door of my garage, where I did my inventing. I explained the whole idea to him and he said they would make a special 9 segment display for me for a front end charge of $5,000 and around $4 per character. But I had to contractually agree to buy a lot of them! I agreed. 1968 Micon Industries is formed by Michael Cannon (a contraction of his name) to encapsulate business activities in electronic design and light manufacturing. 1970 Birth of the MCM project. Mike confides in his friend Kit Corson that he needs a project that "has social value" and is not motivated only by the pursuit of money. Kit replies, "Did you know that deaf people can't use the telephone?" Kit is the son of deaf parents and an interpreter for the deaf. 1970-72 Based on research over a two year period, Mike determines that a product that would allow deaf persons to type to each other over the phone, and that could be small, light, battery-powered, and portable, could be developed using the current technologies of Light Emitting Diodes (LED) and Complimentary Metal Oxide Semiconductors (CMOS). 1972 December- Mike borrows capital from friends and family to launch the project. Mike and Art Ogawa design circuity and prototype the electronic functions. Kit shows Mike the Apcom (Applied Communications, Belmont, CA) TTY directory containing a few hundred phone numbers of deaf teletype users. Apcom manufactures a modem that would allow an older Model 32 teletype machine to send and receive signals over telephone lines. Mike agrees the device should be compatible with the existing network and selects the legacy Model 32 Baudot code protocol instead of the modern ASCII computer code to use in the device. Mike designs the 9 segment alphabet for the LED display and contracts with Lightronix in Sunnyvale to build the chips. Kit sculpts a case mold to Mike's specifications. Mike builds a plastics forming machine. Mike designs the circuit boards and the interior of the case. Kit forms Silent Communications, Inc. (SICO) to sell and market the device. June 17th, 7AM- the first production prototype of the MCM (Manual Communications Module, aka Mike Cannon's Machine) is operational and is picked up at Micon by Kit to take to church with his parents. June 17th, 1PM- Kit returns to Micon with a check for the first sale. Mike tries to obtain capital for manufacturing- nobody is interested. Mike devises the "advanced purchase plan" whereby purchasers who pay in advance will receive delivery of the MCM in 60 days for a $100 discount from the $599 list price. September- Kit places a two page ad in a publication read by deaf and hearing impaired persons. $70,000 in advance purchases is received in two weeks. October- Mike hires staff, buys equipment, and orders material for the first 150 MCMs. December- The advance purchases are all delivered to very happy customers. Kit organizes individual, government, and institution sales of the MCM averaging 100 MCMs delivered per month. Because of the high cost of manufacturing the MCM, institutional sales were important to lower the cost to individuals. The first such customer was the California Department of Vocational Rehabilition (VocRehab) which gave the devices to deaf individuals who needed communications to obtain and keep a job. The MCM is sold to 11 foreign governments and phone companies. Among them were England, France, Germany, Belgium, Italy, Israel, and South Africa. All of the Bell telephone companies purchase MCMs and lease them to individual customers. Pacific Bell was the largest and last to join in late 1975 and leased MCMs for $39 per month. The MCM is purchased by emergency service providers (police, file departments). Mike designs an ASCII version of the MCM. It incorporated a 300 baud modem licensed from Novation, Inc of Southern California. Apcom and Micon start a technology transfer program. The founders of Apcom (Andrew Saks, Jim Marsters, and Robert Weitbrecht) were initially skeptical of the motives of Micon and SICO and treated them as competition. Andrew's daughter, Andrea Saks, opened communications between the companies. Bob Weitbrecht and Mike Cannon traded technical information which led to other cooperative projects between the companies. Apcom and Micon/SICO perform the first International telephone call between a TTY in England and and an MCM in Washington, DC. The call was between a deaf member of the British Parliament and an official of the Department of Health, Education, and Welfare (HEW). The Secretary of HEW, Casper Weinberger, personally congratulates Mike and Kit on the MCM. He later convinced President Richard Nixon to mandate that federal offices should start buying and using MCMs. The MCM is displayed in the Smithsonian Museum and labeled an "outstanding industrial design". Micon takes over sales and marketing of the MCM from SICO. Paul Conover is the new marketing director. William Northfield invests in Micon Industries and becomes its new President. 1976 Micon moves from 1449 29th Avenue to a new, larger building at 252 Oak Street, Oakland, California. MCMs with 64x16 television displays. MCMs with 24x80 CRT displays. MCM/P- A printing MCM for the deaf that was fully portable. The MCM/P was Micon's first microprocessor based terminal. A battery operated version was built, but never produced. MCM with a microprocessor and mass-storage digital tape drive- arguably the first laptop computer. 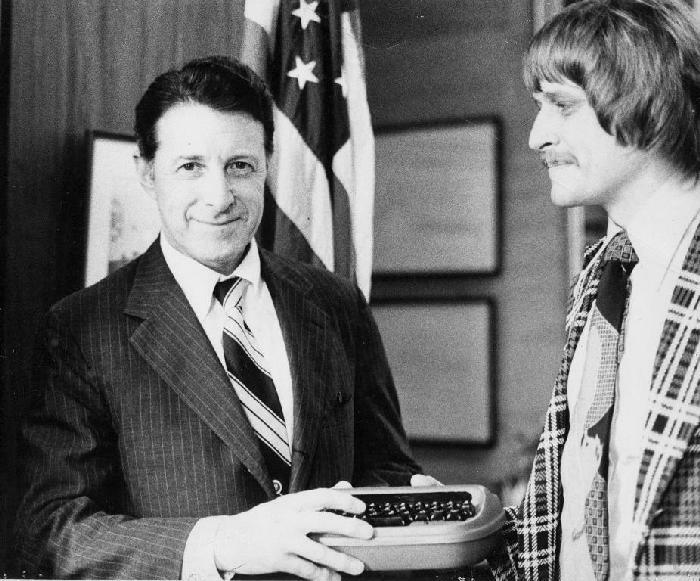 1979 Micon and Apcom convince the California Public Utilities Commission to force Pacific Bell to lease deaf telecommunications devices for the same cost as regular telephone service. A surcharge is added to all telephone bills in California to pay for the cost of implementation. The average initial surcharge amounted to approximately $1.50. This was later adopted by the federal government in the form of a national surcharge. Pacific Bell coins the term "TDD" (Telephone Device for the Deaf). 1980 Michael Cannon leaves Micon. 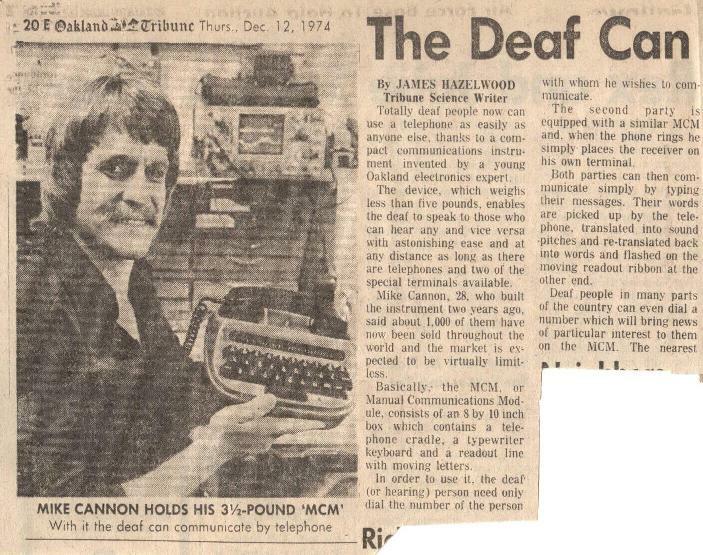 Sales of MCMs for the deaf are 1200 per month. 1982 Micon Industries, Inc. is moved to Connecticut and renamed to the American Communications Corporation. Chris Kreigbaum (Left) and Michael Cannon at the garage in Oakland. Mike built his own plastics forming machine so he could make the MCM cases. 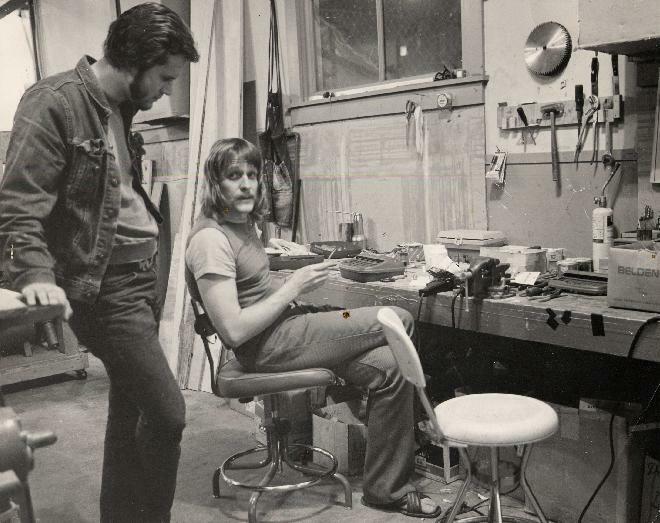 Kit Corson (Left) and Mike Cannon -- December 1973, the first few months of MCM production. 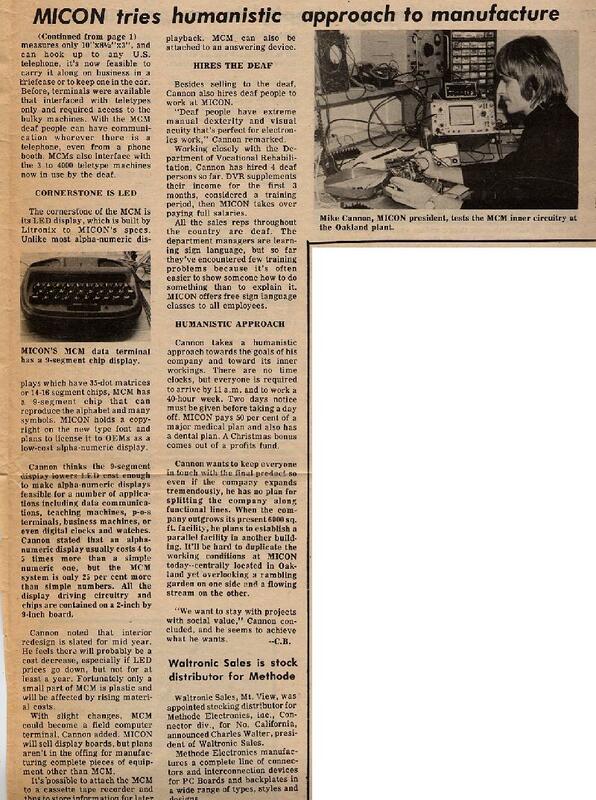 Our first press- Peninsula Electronic News, February, 1974. The coup de grace - recognition in 1975 by the Secretary of Health Education and Welfare, Caspar Weinberger, for a job well done. Michael Cannon is on the right. Paul Conover (Left) and Michael Cannon at the new plant and office at Oak Street in Oakland, California in 1976.